Commerce Lexington Inc.’s partnership with CGI Communications has provided us and our members with the opportunity to showcase our community to the world through a variety of digital media tools. We are not only impressed by CGI’s detailed and organized production process, but we are also excited to take advantage of new services like the GoCast app, the SiteMind Greeter for our web site, and on-line reputation management strategies. It’s an asset to know that there is always quality video showcasing our community when individuals and businesses visit our site. Other community leaders use the Video Tour as a part of their recruitment package. It’s another piece of the puzzle in our branding and outreach efforts. The GoCast app has been a great tool for the Blue Water Area Chamber. It is easy to use and our members can see events and programming happening in real time. It is a great way to provide marketing opportunities for our members. It also gives our members an opportunity to see what is happening at the Chamber and be informed. The GoCast is a great app to use every day to keep your members informed and engaged. Leverage digital media to network, attract members, inform residents, and track it all. Local stories and attractive, custom videos combine to connect you with your online audience. Our digital chamber video tools allow your chamber to be accessible 24/7 and educate and inform new visitors by sending online content without you having to lift a finger. The Chamber Video Tour includes complete video production of a series of topical highlight videos, approximately one minute each, for and about your chamber. From script consultation all the way through editing, CGI's team will work with you every step of the way to ensure your chamber is properly highlighted. A graphic link will be prominently displayed on your municipal website homepage, which will bring viewers to the Chamber Video Tour. Our One-Click™ technology ensures the videos will play on all computer systems, browsers, and internet connection speeds, and our SmartTrack™ technology lets you view statistics and recent activity for your website videos. 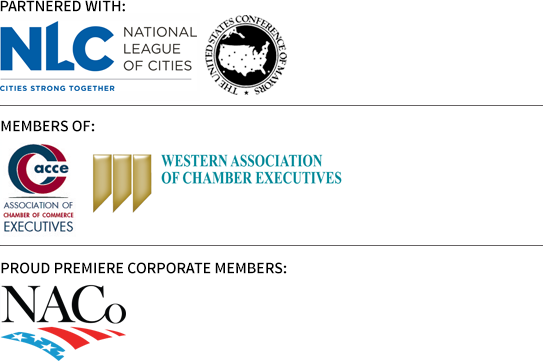 CGI is proud of our partnership with the National League of Cities. Whether you're a small city, a thriving metropolis or something in between, the NLC Community Showcase Video Program highlights the best your community has to offer. Read the letter from Executive Director Clarence Anthony.